Photocopy of 2 page document from an internet search into the family group of John McKay born 2 March 1820 in Dornoch, eldest son of Sackville George Sutherland McKay born c 1782 at Skelbo (see 2008.048.02). 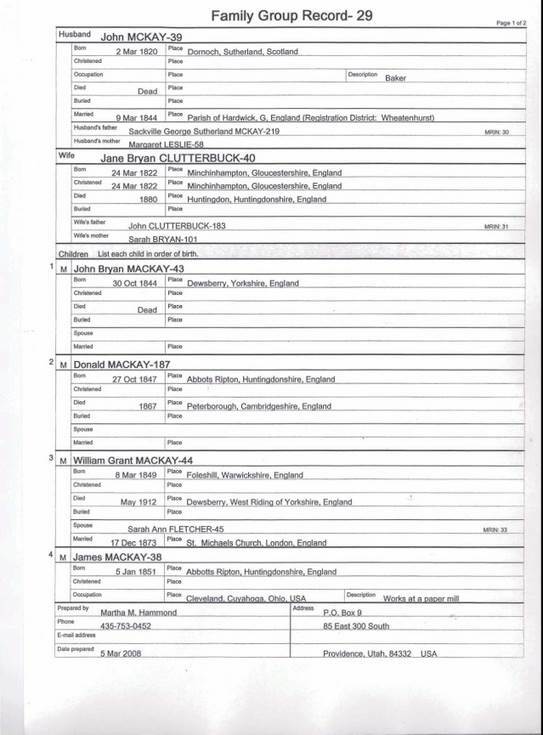 The document provides details of his wife Jane Bryan Clutterbuck born in Gloucestershire and their 8 children, born in Yorkshire and Huntingdonshire. Two sons James and John Hugh emigrated to Cleveland Ohio and married there. I am wondering if this is the right John Mackay. Do you have proof that he married a Jane Bryan Clutterbuck 1844? Please let me know.